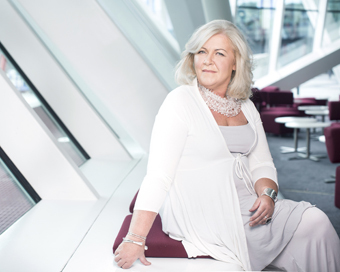 The 2014 Newstalk WMB Female Social Entrepreneur Award recipient is Debbie Deegan, the big heart behind children’s charity To Russia With Love. The Dubliner’s journey started in 1998 when she began the process of adopting a little girl from a rundown western Russia orphanage. Although Debbie and her husband were not qualified to adopt that didn’t stop them from keeping seven year- old Zina without the necessary paperwork. It was a four-year process the stay-at-home mum didn’t have time to undergo. “The Irish authorities weren’t supportive, they told me to send her back and come back for her when I had passed my assessment. So I completely ignored the Irish side and kept her. Once I knew that the Russians didn’t come looking for her, I knew we could keep her safely,” recounts Debbie. “Zina had no family in the world and she’d never had a visitor in seven years so I felt no matter what happened in her life, coming to us had to be better than what she had.” That was 1997 and a year later when Zina was speaking English she started telling stories about the children she had left behind. A year later Debbie went back to find those children, who she felt should remain in Zina’s life. “I got on a plane and went to Russia to look for this orphanage and I’m still there 17 years later. I can’t get out of the place!” she laughs. “I didn’t realise it was going to be a lifetime commitment but I made a promise to the children when I got there. People said she was never going to be able to do it but this formidable Irish mammy was determined. Aware of the enormous battle ahead, when Debbie arrived home she made a plea to the people of Ireland on national television. “I had never been on television in my life and I never wanted to be,” she adds laughing. “But I was in the position where I had to ask Ireland for help.” Miraculously the next day the help started to snowball. Lists upon lists were built. “We started doing educational, medical, and sports programmes, we just grew. As the Celtic Tiger grew the money grew in our bank account, which allowed me to do more stuff.” Unfortunately when the Celtic Tiger started to meow instead of roar, donations turned to pennies instead of euros. “This is why awards like the WMB Newstalk Social Entrepreneur Award make a difference now. In terms of publicity it’s fantastic,” says Debbie. At the height of the funding To Russia With Love was spending €800,000 a year on children’s programmes. Today there are seven programmes on offer for the children. One example is the young Mother and Baby programme, which aims to not only teach the fundamentals, but also to break the cycle of orphaned girls putting their children into orphanages. They are provided with all necessary items that a new mum and her baby need. “The biggest gift we’ve given our children in 17 years is we’ve given them back their self esteem. Many of the To Russia With Love children think they are normal and that was my goal at the very beginning. In Russia orphans don’t go to college but 67 percent of our children go to college and are successes. None of our girls are prostitutes; none of our girls are trafficked. Not one of our boys in 17 years has gone back into prison and something like 90 percent of Russian boys coming out of institutions go back because all they know is institutionalised life. Ours don’t do that. We don’t have runaways because they know they are loved where they are.” One of Debbie’s orphans is a lawyer now. Debbie’s life is split between Ireland and Russia. She visits the orphanages every six weeks, crediting her solid family structure for allowing her to maintain the hectic travel schedule. With two books under her belt, a charity shop opened earlier this year and an animated feature film telling the story of their Russian orphans, Debbie is driving fundraising using every avenue possible.